The entrepreneurial spirit is alive and kickin’ in Wilmington as both new start-ups and innovative companies celebrated the Coastal Entrepreneurial Awards. The Coastal Entrepreneurial Awards are a collaboration between the University of North Carolina Wilmington’s Center for Innovation and Entrepreneurship and the Greater Wilmington Business Journal who seek to shine a spotlight on new start-ups and up-and-coming businesses in the Cape Fear Region to showcase the region’s entrepreneurial activity recognizing innovative firms and organizations. The Awards ceremony, held at the UNCW Burney Center on Wednesday, May 24th was a culmination of the judging over the last six weeks. Through the selection process, the judges narrow the field from over 100 applicants, and select only one for each category. After a Company is nominated, and submits a written Executive Summary and a video, an interview is scheduled with the judges who represent a diverse cross section of the region’s business community. Among the many speakers at the Awards ceremony and breakfast were UNCW’s chancellor, Dr. Jose V. “Zito” Sartarelli, who highlighted many reasons why entrepreneurship is encouraged. He acknowledged the business partnerships with the University, and how critical it is to have thriving business and economic development in the area, as a good percentage of college students are employed. Vicky Janowski, editor of the Greater Wilmington Business Journal also saluted the entrepreneurial spirit, and described how the reviewers and judges went about the selection process. 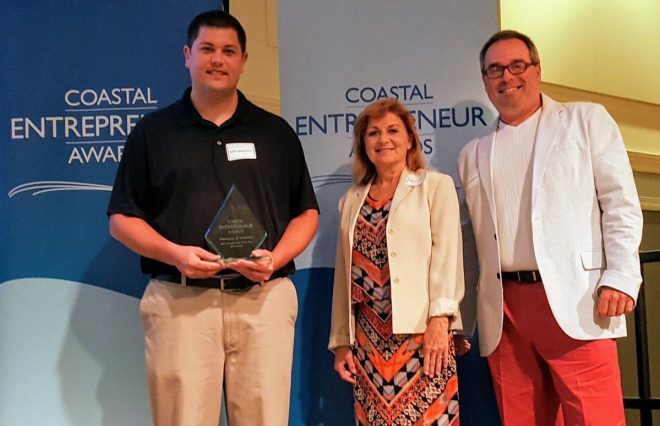 An entire Greater Wilmington Business Journal was devoted to the Coastal Entrepreneur Awards. A reporter interviewed each candidate and a page was designated to each category winner, describing their products and/or services. During the week, the Journal publicized the companies by sending out tweets, drawing viewers to the winners’ websites. One of the thrills of the event, was discovering businesses and trends in the Cape Fear Region that we didn’t know existed. The business winners include a wide range of companies that run the gamut with everything from non-profits designing jewelry and donating half of their profits, to tactical laser tag, from equipment manufacturing, to internet room design, from providing service dogs to people with physical and emotional disabilities, to a sports management software firm, one who provides health care housing for dementia patients, one who connects businesses during a popular film event. One firm provides life skills training, counseling and hope for those trying to get back into the job market. Our firm, Cavanaugh & Associates, was a winner in the biotechnology category. These take-aways evolved from the many presenters: Entrepreneurial Spirit exists because of ideas, visions and dreams which can become reality if you have the passion to pursue them and the perseverance to see them through to create a company. There is risk involved, and not all companies succeed, and sometimes, success comes with personal sacrifice. You need financial planning, marketing, organization, motivation, and sometimes you need to change your direction to facilitate growth based on new trends, discoveries and pathways. Finding a way to communicate your ideas to others is one of the keys, and finding your niche among the competitors is paramount. Once each firm’s video was on the big screen, a member of the business community introduced them, and the owner(s) had a few minutes to describe what their firm does. It is not easy to explain Water Efficiency and Bioenergy in a few words. Cavanaugh is not a new firm, and recently had its 20-year anniversary, but over the past decade, changed its focus and mission to concentrate solely on stewardship in the water efficiency and waste-to-energy sectors, two very up-and-coming areas that have proven to achieve growth and development. As Gus Simmons, one of the partners and the Director of Bioenergy, accepted the award for Cavanaugh he talked about dedicating our working careers to promote stewardship of resources. He conveyed how our water loss recovery efforts have reached over 1000 utilities in the U.S., have recovered over a billion gallons of lost water, and saved tens of millions of lost revenues recovered for utilities. He also recounted how the NC Utilities Commission just permitted our new waste-to-energy project, Optima-KV, which will be the first project to put the initial molecule of pig manure into the natural gas pipeline to help achieve N.C.’s Renewable Portfolio Standards and achieve improved waste management in the state. The Executive Summary we submitted explained more about our two key focus areas. Our Water Efficiency Technical Assistance Programs are now implemented across the nation, educating utilities in the effective assessment of their water management practices. By training utilities in water auditing they learn to identify where to look for lost water and lost revenues. We have conducted water efficiency training programs in 26 out of 50 states, including California – the largest water system in the country. Actual data from a water system implementing the Cavanaugh Water Efficiency methodologies, showing a reduction in total water supplied while customer demand increased – a 10 million-gallon per day reduction in water loss, providing over $1.6 Million in annual revenues recovered by this utility. Secondly, we described what waste-to-energy or bioenergy is, and our newest project was highlighted. Why some may not understand the sustainable impact of the Optima-KV project in Duplin County, it is truly on the cutting edge and will revolutionize swine waste management in our state, helping to reduce our dependence on fossil fuels. The manure on each of 5 adjacent farms and over 60,000 pigs will go through anaerobic digestion, and be aggregated by pipeline to move it to a central processing system, where it will be purified and then injected into the natural gas pipeline. 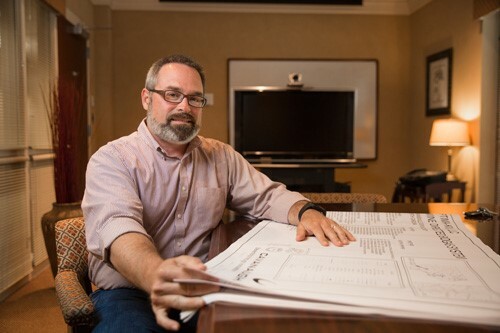 This innovative project will provide improved environmental standards as it eliminates odors, vectors and greenhouse gas emissions, improves air and water quality and will be the first interconnection on the East Coast to put swine gas into the pipeline. 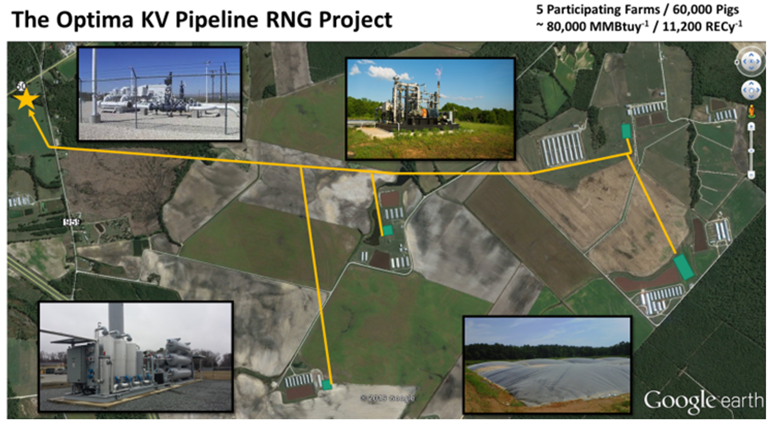 Aerial photograph and supporting photographs of Optima KV project with overlain illustration of the biogas generation systems (shown in green), biogas aggregation pipeline (shown in yellow), and gas refining system, located at the star, on the existing natural gas pipeline transecting one of the participating farms. As there are over 20 million hogs and 2,000 wastewater lagoons in our state, this solution is a major fundamental step forward demonstrating progress in environmental swine waste management. The Optima KV project is under contract with Duke Energy and will generate approximately 80,000 MMBtu’s annually or about 11,000 megawatt hours of electricity, which can power about 880 homes and businesses per year. Bioenergy has a unique advantage over other renewable energy sources like wind and solar, as it can be stored and used when it is needed. . North Carolina is recognized as having the 3rd richest bioenergy resources in the country. The US EPA, USDA, and DOE Bioenergy Roadmap reported the potential for 11,000 new bioenergy systems in the U.S., with the American Biogas Council identifying 900 of those can be developed in North Carolina. The U.S. bioenergy potential is tremendous and translates to over $33 billion in capital deployment for construction, approximately 275,000 short term construction jobs, and 18,000 permanent jobs to build and run the bioenergy systems. 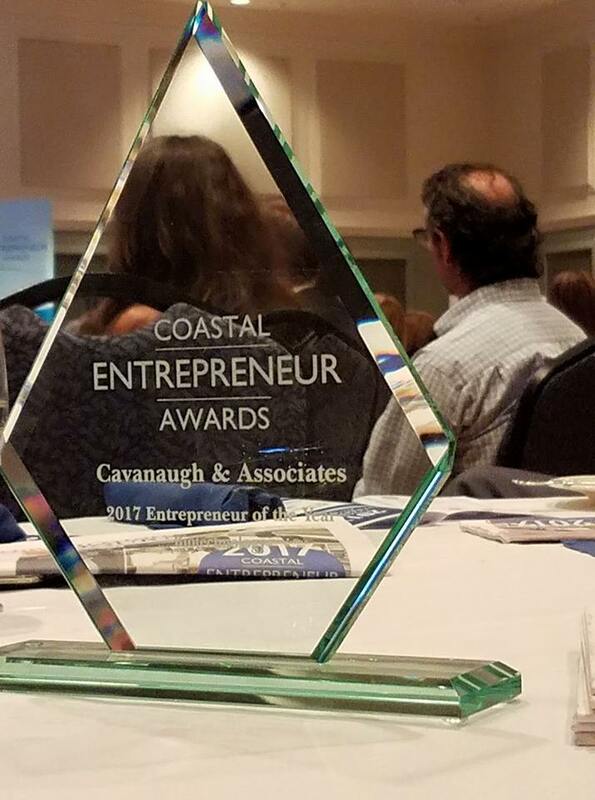 We would like to thank UNCW’s Center for Innovation and Entrepreneurship, the Greater Wilmington Business Journal and all the sponsors for this award and the engaging and well-organized event. We would also like to thank the NC Biotechnology Center for the nomination. Featured Image: Jeff Cappadona, Sharon Niemann and Gus Simmons, of our Wilmington Office receiving the 2017 Coastal Entrepreneur Award in Bioetechnology.